This is made with a spiced rice mixture from Iran. Wrapped in a filo parcel, it looks truly festive. Preheat the oven to 190ºC, gas mark 5. Heat a third of the butter in a medium flameproof casserole dish with a tight-fitting lid, add the squash and cumin and cook over a medium heat for 5-6 minutes, until the squash starts to soften. Meanwhile, in a small pan, bring the stock to the boil, then add the saffron, remove from the heat and allow to infuse. Stir the rice into the squash and cook for 1 minute, then pour the stock over and bring to the boil. Add the currants, then cover and place in the oven for 18-20 minutes, or until the rice is cooked. Allow to cool for 10 minutes before stirring in the egg yolk, coriander, toasted almonds and cheese. Season to taste and allow to cool completely. Melt the remaining butter, then lay 4 filo sheets on a work surface and brush liberally with some of the butter. Top each with another layer of filo, at a 90º angle, then brush again with butter. Top with a final filo layer, again at an angle. Brush again. 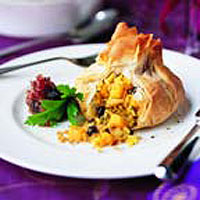 Spoon a quarter of the squash and rice mixture into the centre of each filo stack, then bring the filo together to form a pouch. Prepare all 4 pouches the same way and place on a greased baking sheet. Brush the pouches liberally with the remaining butter, then bake for 12-15 minutes, or until golden and crisp. Cool slightly before serving with the fresh date chutney, right, and vegetables. Make the day before and keep covered in the fridge until ready for baking. Or freeze in an airtight container for up to 1 month. Thaw, then cook in the preheated oven as in Step 4.